What are the benefits of our consultancy for HSE Management System? Creates a more efficient, effective operation with proper implementation of HSE system. Effective internal audit by us reduces need for third-party audits. Reduces risk of accidents and incidents in your organization. Improves employees' motivation, awareness, and morale through our HSE awareness training. Your business can promote international trade base on international certification. Effectively implemented system reduces risk and cost, which increases profit. HSE system helps you in reducing waste and increases productivity. The Health, Safety and Environment Management System - HSE training presentation kit is designed by experienced team of EMS and OH&S consultants. It is a very useful tool while conducting corporate training on health, safety and environment management within the organization or any work area. It can be used as a training material for HSE awareness and internal auditor, which is designed in completely editable ppt slides and .doc formats. Our clients have used it while preparation for ISO 14001:2015 and OHSAS 18001 internal auditing. Our custom-designed Powerpoint presentation meets the requirements of EMS and OH&S certification. 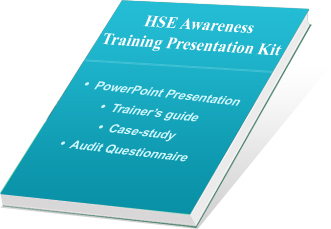 HSE Training Presentation kit - 2015 contains total 225 slides in two parts as given bellow. Topic wise HSE Training presentation kit contains following key modules for Environmental and Health Safety certification audit requirements. Overview of environment and health safety management systems. Aspect and Impact of the HSE systems. Awareness of ISO 14001:2015 and OHSAS 18001:2007 HSE for vendors. HSE management system documentation process. Steps for HSE system (Health, Safety & Environment) installation. EMS and OHS questionnaire - 04 Workshops. Practical auditing examples - Case-study 1 and 2. Sample Risk template for HSE - 01 excel file to maintain risk records. Hand-outs written in MS Word document 2007 and Presentation made in Powerpoint. Designed as per requirements of revised ISO 14001:2015 and OHSAS 18001:2007. Developed under the guidance of experienced EMS and OHS auditors and consultants. User can add company logo as well as voiceover to the presentation for training of staff. Completely editable presentation, hence, time-saving and cost-saving to create new training material for own use. The auditor training kit on HSE is verified and evaluated at various levels by our team and more than 1000 hours are spent in preparation of this training presentation kit. View free Demo of Training Presentation Kit and purchase complete product with secure online transaction via Paypal.com. Our products are sold in more than 65 countries.